One of the brightest and most colourful of the Galapagos insects, the large painted locust likely colonised the Islands by flight. 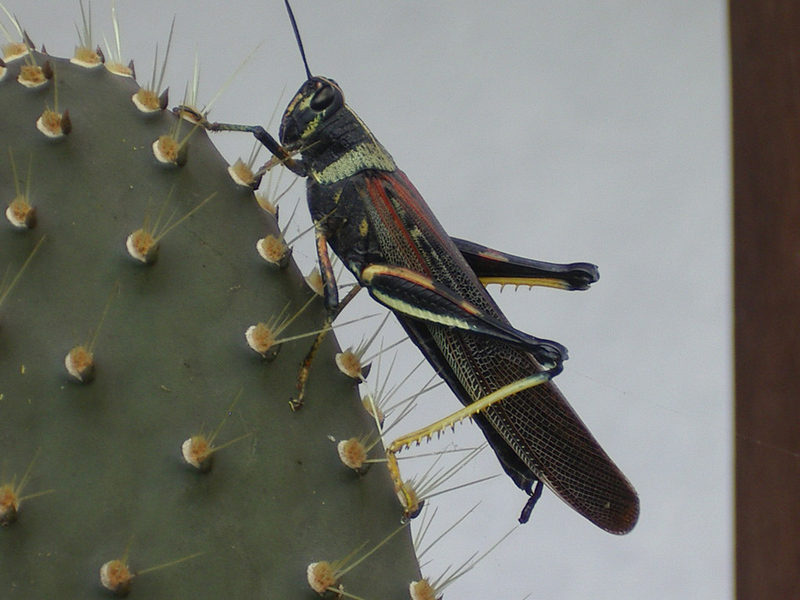 The large painted locust is one of two species of painted locust endemic to the Galapagos Islands. First described by Carl Stål in 1861, they can easily be identified by their bright colouration. They are found on all islands except for Espanola, where the small painted locust is present. They are abundant in the lowlands, particularly after heavy rainfall, and can often be seen surrounding lights on the inhabited islands. They are predated on by lava lizards and the Galapagos hawk. 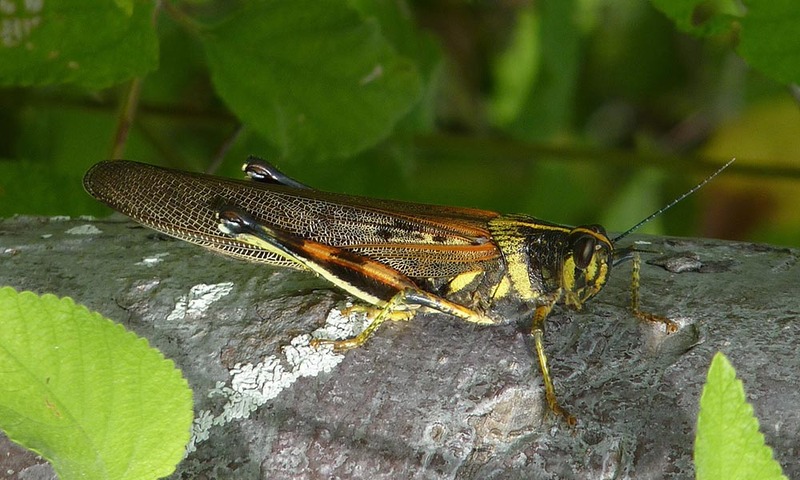 The large painted locust is not closely related to any mainland species, but it is believed they most likely colonised the Galapagos Islands by flight as they are very strong fliers. They are also very good jumpers, easily able to reach up to 3 metres. The large painted locust belongs to the genus Schistocerca. Commonly called bird grasshoppers, this is a genus of grasshoppers many of which swarm as locusts. There are around 50 other species in the genus of which the best known is the desert locust. The small painted locust is, as the name suggests, a smaller locust with a more drab colouration. 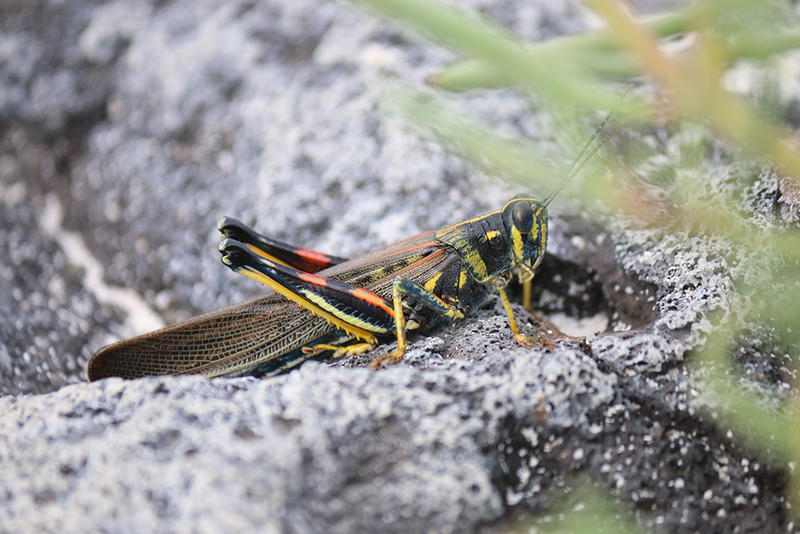 Where to see them: The large painted locust is widespread and can be found on all islands, except for Espanola. They are usually found in the arid to humid forest zone. When to see them: The best time to spot a large painted locust is during the rainy season from March to May. Threats: Lava lizards and Galapagos hawks are native predators, however it is unlikely that this has a detrimental effect on the population size of the locust. Conservation action: The are currently no projects specifically focused on the conservation of the large painted locust.